By classic biological definition, a particular citrus rootstock-scion combination when infected with Candidatus Liberibacter asiaticus (CLas) would be considered tolerant if infected trees had no more than slight reductions in performance, sometimes accompanied by a reduced level of the pathogen. That definition implies that the plant can cope with infection and continue to be productive and profitable. The scientific community is working to understand and define biological tolerance. The progress is encouraging. In the meantime, a practical definition is needed. Choosing to plant trees on particular rootstocks should be based on realistic expectations and knowledge of field performance. Figure 1. Hypothetical outcomes of one citrus variety on each of five rootstocks with or without Clas infection. Even a simple definition such as that one, however, becomes complicated given all the factors involved in rootstock performance. Accumulating evidence indicates that nutrition and psyllid dynamics are involved in the impact of HLB. Also, economic tolerance will require a financial analysis to quantitatively define the point when profit occurs. Rootstocks in the absence of HLB have different horticultural properties that may not be equally affected by Clas infection. For example, let’s set aside tree age, scion variety and planting density for the moment and focus on a few general hypothetical outcomes (see Figure 1). Beginning with Rootstock A, notice that trees on that rootstock produce about four boxes/tree with or without HLB. Such scion-rootstock combinations are highly desirable because they yield well and that attribute is largely unaffected by HLB. Unfortunately, those rootstocks have not yet been discovered. Trees on Rootstock B also yield well without HLB, but yield is markedly reduced with HLB. Such rootstocks exist, but are not economically tolerant. Planting such rootstocks makes little sense in an era of widespread HLB, unless there are tools available to mitigate the HLB impact. Trees on Rootstock C yield a little less than those on Rootstock B without HLB and also lose yield from CLas infection. However, all things being equal, one would choose Rootstock C rather than B because of less CLas impact among trees on Rootstock C. Trees on Rootstock C could be considered economically tolerant. Trees on Rootstock D have low yields regardless of CLas infection. As a result, it could actually be considered biologically tolerant. However, in comparison, Rootstock C would likely be a better choice than Rootstock D because infected trees on Rootstock C produce more than those on Rootstock D with or without HLB. Trees on Rootstock E have the highest yield among all rootstock options in the absence of HLB, but they would not be considered biologically tolerant because yield is greatly affected by CLas infection. However, note that while the yield among infected trees is lower than it is for those on Rootstock A, yield is higher than for trees on Rootstock B, C or D. Rootstock E would also appear to be a good choice to plant. To aid in the rootstock selection process, perhaps all rootstocks can be usefully classified into one of the five response-types illustrated in Figure 1. However, there are a few issues that must be considered first. It is virtually impossible to measure rootstock performance in the field today free of HLB. So that issue becomes a matter of field testing and making comparisons among trees infected with CLas. Is that valid? Yes, because the main point of this story is that field evidence shows there is always a portion of the trees on virtually any rootstock that exhibits a limited or no visual response to CLas infection and a portion that is rendered uneconomical by HLB. The question then becomes: What balance of affected to unaffected trees and the degree of that difference would lead to a rootstock being declared economically tolerant (Figure 1)? Also, because there is this balance, estimating potential yield under endemic HLB field conditions is possible by measuring the yield of the “good” or largely unaffected trees and calculating potential yield, i.e., what the trees on a given rootstock could produce if all trees performed like the unaffected ones. Figure 2. 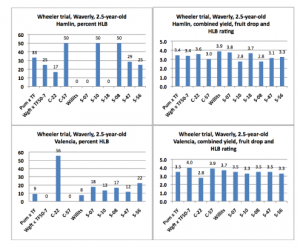 HLB status, yield and fruit drop evaluations made in December 2015 of trees in a Central Florida cooperative trial planted in June 2013. 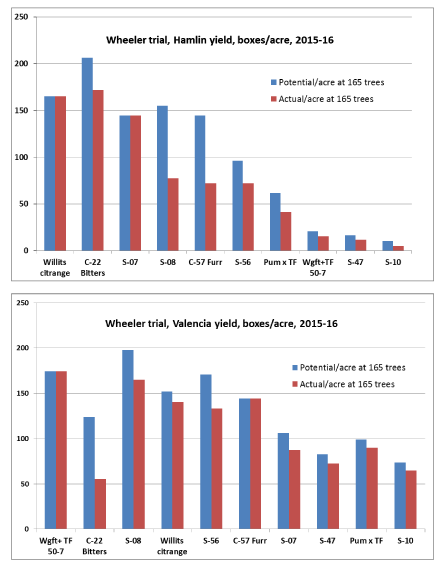 Trees were rated based on the range of tree conditions observed in the trial. 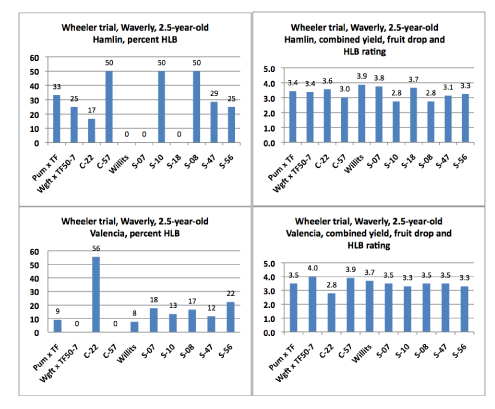 The rating scale combined HLB status (visual symptoms), yield and fruit drop where 0 = dead; 1 = badly affected by HLB with virtually all fruit small and dropped, and tree height reduced; 2 = HLB symptoms apparent, tree size not markedly reduced, significant fruit drop; 3 = light HLB symptoms, little to no fruit drop or reduction in tree height; 4 = canopy appearance and fruit crop excellent, HLB symptoms virtually absent with no fruit drop. The percentage of HLB-affected trees (upper and lower left-hand panels) was determined by summing those trees with a rating of 0, 1 or 2. The upper and lower right-hand panels show the average rating across all trees of each scion-rootstock combination. Rootstock codes are C = California and S = Spain. If comparing rootstock performance among infected trees is valid, another consideration is how to measure and interpret it. Anecdotal observations by growers along with ratings in trials are valuable. In University of Florida/Institute of Food and Agricultural Sciences (UF/IFAS) field trials, trees are rated visually for some combination of tree canopy condition, yield and fruit condition. Also recorded is the number of trees within a rootstock that are in good or poor condition as a result of HLB. An example of that approach is taken from a Ridge trial of young Hamlin, Valquarius and Valencia trees on a series of rootstocks with mostly eight to 24 trees of each scion-rootstock combination (see Figure 2). Among the Hamlin and Valencia trees, HLB responses varied. Most trees on Willits citrange were in good condition with good crops and little visual evidence of HLB, while up to 50 percent of the trees were HLB symptomatic on other rootstocks. It was also apparent that there tended to be lower incidences of HLB symptoms among those trees on rootstocks with the best combined ratings for yield and fruit drop. 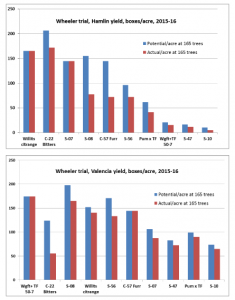 A statistical examination of the combined ratings (Figure 2, upper and lower right panels) showed that trees on Willits citrange had a true higher average rating than those on other rootstocks rated 2.8. Do any rootstocks in the field trial meet the proposed definition of economic tolerance and would they be classified as one of the rootstock types of Figure 1? To examine that question, the disease ratings were combined with the 2015–16 yield data and used to calculate “potential” yields (see Figure 3 caption for an explanation of the calculation). The red bars represent the actual measured yields of those trees on a given rootstock and unaffected by HLB. Those results provide the link needed to connect Figure 1 to Figure 3. 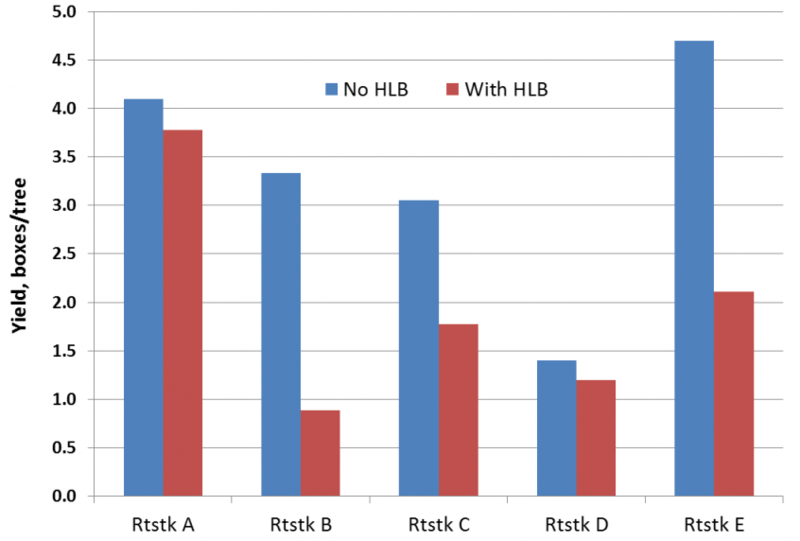 The blue bars in Figure 1 represent hypothetical yield, i.e., productivity of trees free of HLB. The blue bars in Figure 3 represent something different. They show potential yield based on trees growing in a commercial HLB environment and calculated by expanding the measured yield (red bars) to show what is possible if all the trees on a given rootstock produced the same amount of fruit. On that basis, the trees on several rootstocks look promising depending on the scion variety and might be defined as economically tolerant. However, more data and a profit line are needed before any reliable recommendations are possible. The last part of this story is about interactive factors. At the young-tree field trial, there are three varieties — Hamlin, Valquarius and Valencia — on mostly the same set of rootstocks. These scions so far have different HLB responses on a given rootstock, suggesting that rootstock performance may be dependent on the scion variety. Furthermore, grower observations indicate certain scions like Temple and navel orange are less affected by HLB than Murcott and other seedy varieties (see www.crec.ifas.ufl.edu/extension/horticulture/citrus_varieties.shtml). Thus, equal consideration should be given to the scion and rootstock when selecting trees for a grove. Cultural program is another important interactive factor. Differences among psyllid management programs and their application at a given site might partly explain the variability in HLB reaction of a particular rootstock. There may be nutritional effects as well. These factors could alter how a rootstock reacts and help explain why rootstocks like Wgft+TF50-7 behaved so differently with Hamlin or Valencia scion. Something like nutritional therapy could close the gap between potential and actual yield or even raise the overall performance of a rootstock. The role of interactive factors in defining tolerance would be a profitable research focus. Meanwhile, field evaluation of scions and rootstocks must continue. Tolerance can be defined in terms of the types of HLB responses presented herein, but economic tolerance can only be assessed by growing and evaluating trees to the point where there is a demonstrated return on investment. Caveats: No juice-quality data were collected. For processing fruit in particular, yield is the dominant factor determining economic tolerance, but juice quality could influence how this story is interpreted. No trees on standard commercial rootstocks were included in the planting, so a direct comparison between those rootstocks and the experimental ones is not possible. Nevertheless, it is likely that readers are sufficiently familiar with the performance of trees on standard rootstocks to allow an indirect comparison. The Valquarius data were not included in this story, but are part of the full story to be posted on the Citrus Research and Education Center website (www.crec.ifas.ufl.edu/) under Extension, Horticulture, Varieties and Rootstocks. Acknowledgements: Grateful appreciation is extended to Mike Roose for providing seed and advice regarding the C-series from California (C-22 Bitters, C-54 Carpenter and C-57 Furr), Juan B. Forner regarding the S-series from Spain and the Wheeler family for supporting the project. This article underwent considerable improvement between the first and final drafts because of the stimulating and helpful reviews of Larry Black, Ed Stover who also provided statistical analyses, Pete Spyke, Steve Rogers, Fred Gmitter, Jude Grosser, Greg McCollum, Kim Bowman, Mike Roose and Donovan Brown. Bill Castle (bcastle@ufl.edu) is professor emeritus at the UF/IFAS Citrus Research and Education Center in Lake Alfred.